RiverSoftAVG released an amazing multimedia add on package for their RiverSoftAVG SVG component library. This add on contains instrument multimedia components which are high quality, high resolution and easily customizable. This component library is available for Delphi Berlin on Windows, OSX, Android, IOS for both VCL and FMX. 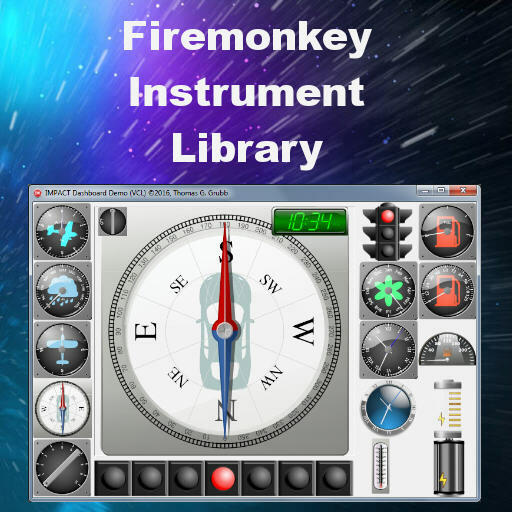 The suite contains over 15 gauges and gadgets, including clocks (TRSClock, TRSCircularClock, TRSDigitalClock), compasses (TRSCompass and TRSCircularCompass), batteries, speedometers, lights, an altimeter (TRSCircularAltimeter) and a barometer (TRSCircularBarometer). For the developers who are interested in the library architecture, the full source code is provided, the components are resolution independent with a small footprint for your applications and no other external files are required. When it comes to implementation, the library provides the developer integrated IDE Help Insight as well as Help File and Online Documentation. Please note, that in order to use these amazing components, you are required to install RiverSoftAVG SVG Component Library or buy IMPACT as a bundle with the SVG library. Demos are provided, with no limitations to test the full features of the library. When demos not running within the IDE, a nag screen will be displayed. Apart from the multimedia package, RiverSofAVG library also contains some very useful components like: Inference Engine Component Suite, Fuzzy Logic Component Library, Genetic Algorithms & Programming Component Library, very handy when you have projects dealing with Artificial Intelligence. RiverSoftAVG is a commercial package has a decent cost to it but the site license is much more expensive. Additionally, you have the option to buy the components individually or to buy them for a certain IDE. This last option is much cheaper and tailored to everyone’s needs. Head over to check out the amazing RiverSoftAVG IMPACT available for Delphi Berlin (Win32/Win64/OSX/iOS/Android).